As of this morning, I’m officially PUPO-Pregnant Until Proven Otherwise. You really can’t make this stuff up. I’m tempted to design a line of fertility treatment inspired t-shirts emblazoned with all of the crazy terminology and acronyms you learn along the way. Today was a GREAT day. We didn’t think Matt was going to be able to make it because he was out of town working. By some crazy miracle, he made it back in town and popped into my room with moments to spare. 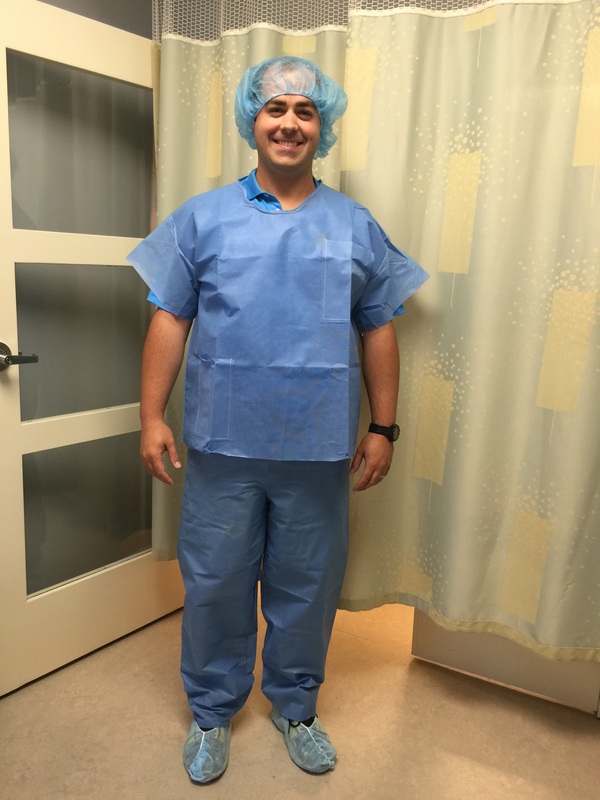 Doesn’t he look cute in scrubs? Daddy all scrubbed up and ready to go! 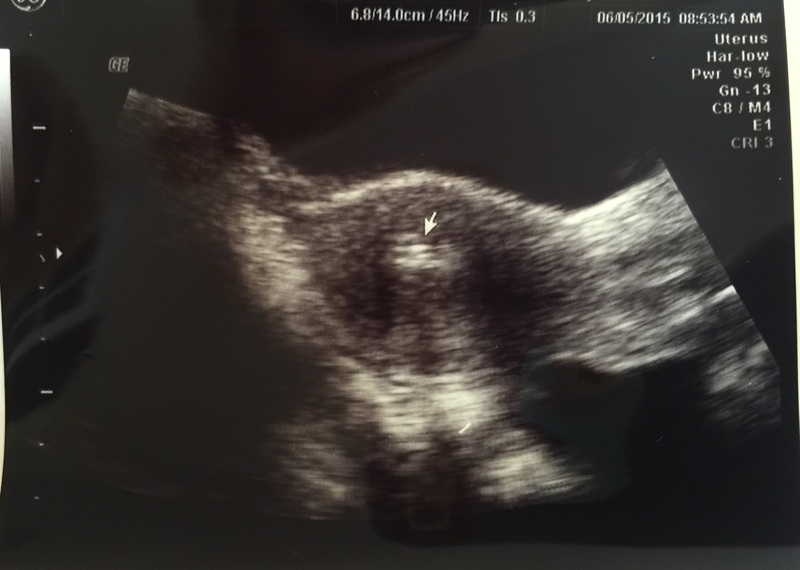 We waited around for a little while until the embryologist gave a final report. 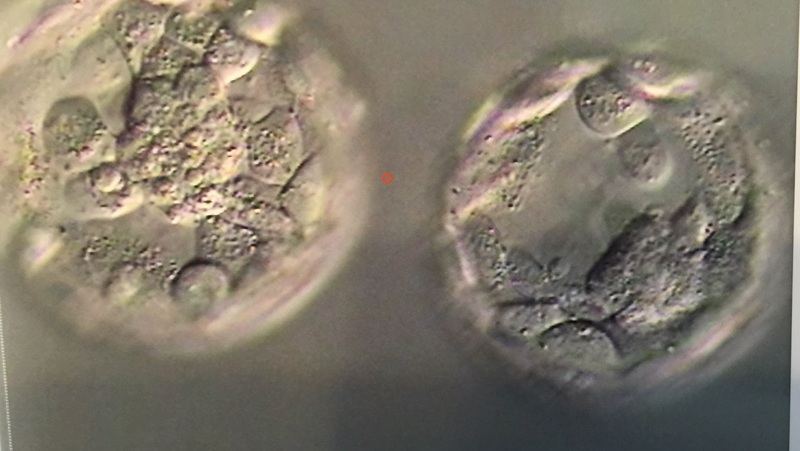 8 of our embryos made it to the blastocyst stage. 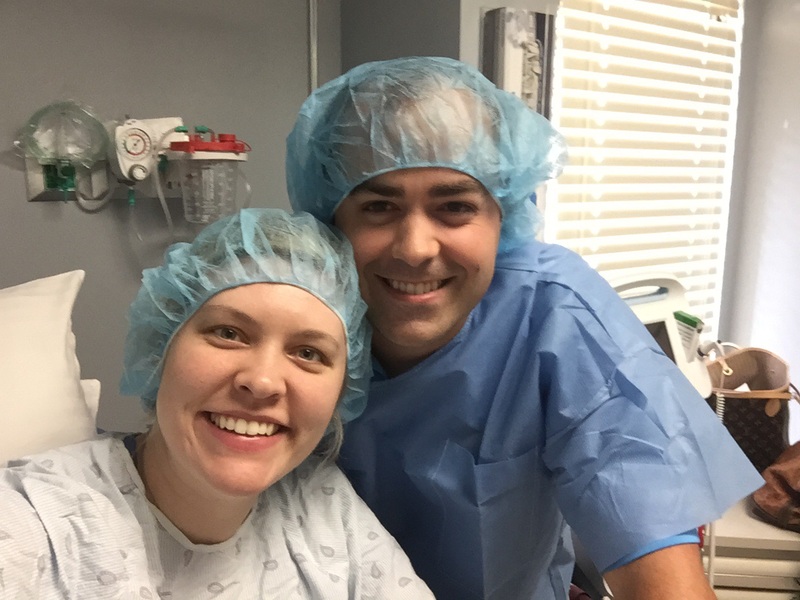 We spoke with our doctor and confirmed our decision to implant the 2 best blastocysts this morning and freeze the remaining 6 for later attempts. Then he handed us our first picture of our sweet little babies, and I just about lost it. They are the most beautiful little babies I’ve ever seen! I immediately pulled a sheet protector out of my purse to put the picture in before it got damaged. Everyone got a pretty good laugh out of that. Then it was time for the transfer. Everything went well. It was incredible to watch the embryos going into my uterus on the screen. Definitely a moment Matt and I will never forget. We even got our first ultrasound picture of the embryos inside of my uterus! That one went straight into the sheet protector too! The embryos are the little white area under the pointer! Some time within the next couple of hours the embryos should hatch out of their shells and (HOPEFULLY) implant in my uterus. I am on strict bed rest for the next 48 hours while these 2 little babies do their thing. I’m already giving them pep talks and telling them to make themselves at home. They better listen to their Mama! On June 15th, I’ll get a blood test that will tell us whether they have decided to stick around. Congrats! So great that Matt could be there! Sending lots of sticky vibes and crossing my fingers for you!!! This is wonderful news. Hang in there parents. God will bring you through this with his perfect plan! Thank you, Mrs. Victoria!! Having faith that it will all go according to His plan!! Thank you, Kelly! You continue to be in my prayers!! So glad your husband made it for the special moment! I hope you are resting up well (interestingly in the UK they tell you to take it easy but they don’t tell you to completely rest at all, they say no evidence that it helps, and also good to walk around a little to get blood flow to the uterus). Praying your two little ones are getting nice and comfy! I hope the two week wait is kind to you! Thank you! I know, the U.S. is the only country that does bed rest after transfer. They are very honest about the fact that they don’t have any proof that it helps, but they still require it anyway. Haha! Doesn’t make too much sense does it?